The item Doctor Who, Issue 2.1, The tenth doctor year two, Nick Abadzis, Elena Casagrande, Claudia Ianniciello, (electronic resource) represents a specific, individual, material embodiment of a distinct intellectual or artistic creation found in Richland Library. 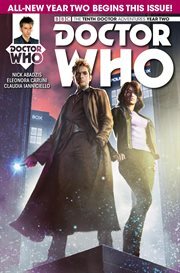 THE SINGER NOT THE SONG', Part 1 A fresh new start to an all-new Year Two, as the Tenth Doctor ongoing series takes to the stars! Looking for rest and relaxation, the Tenth Doctor and companion Gabriella Gonzalez take a trip to Earth Station Presley, a mining platform around an enormous gas giant - and home to one of the most spectacular sensory experiences in the universe! The gas giant is a perfect example of human colonists living in harmony with indigenous life - in this case, the Shan'tee: conceptual beings perceived by humans as hauntingly beautiful music! But the Doctor and Gabby are walking straight into a war. Something has corrupted the song of the Shan'tee - a mysterious signal of unknown origin - and now the human colonists are trapped in a fight for their lives! Can the Doctor, Gabby, and a synesthetic scientist uncover the truth and bring the war to an end without further bloodshed... or will the song consume them all? And... why does Gabby feel like the alien foes she's been facing are starting to rhyme...? Is there something less random and more sinister at work...? Alternating art team Elena Casagrande and Eleonora Carlini continue their stratospheric rise, while writer Nick Abadzis plots an epic arc for the ages! Don't miss the all-new chapter in the lives of the Tenth Doctor, Gabby and Cindy!